Although I’m not a total technoramous, I limit my high tech usage out of principle; I believe technology is quickly exceeding the social and intellectual capacity of most dog breeds to use it wisely. Aussies are the exception, of course, but as my grandma would say, all things in moderation, even for Aussies who can manage all manner of excess. So, while some dogs are on Twit-time and Facetube all day long, I abstain. Oh, sure, I have collar I.D. (my dog tags), a laptop (I occasionally lie on Mom’s lap while she’s watching TV), an IPad (the comforter I use for sleeping), and I Wii (on just about every tree in sight), but I prefer to post my blog entries by dictating to my dad..so blame him for any misspellings or grammatical errors. Occasionally, I’ll make a comment on current events. I know – dogs have no idea of current events, much less the capability to comment, but I’ll remind you that I am an Aussie. Two items attracted my attention today. First, in the Secret Service scandal involving prostitutes in Colombia, two Marine dog handlers were also being investigated. One reporter had the unmitigated nerve to infer that the dogs somehow facilitated and even engaged in the alleged sexual activities. With absolutely no evidence to support any untoward activities by my cousins, I feel this wild indictment of our canine troops is an outrage. My supposition is that the dogs in question probably attempted to dissuade their handlers from conduct which they would later regret, but I guess I’ll just have to wait for investigators to sniff out the entire story. Hopefully, dogs will be represented on the investigation team, as sniffing is their forte. Finally, this Sunday, April 22, marks the forty-second observence of Earth Day. I intend to celebrate by watering as many trees my seemingly infinite bladder capacity can handle. Dad said he will outfit me with a backpack, and we will walk the neighborhood streets gathering debris to be deposited in my pack. Right. As usual, his plans are approximately a galaxy away from what will actually happen. I predict that I will be a bit under the weather, and he will look just lovely in a Petsmart backpack. 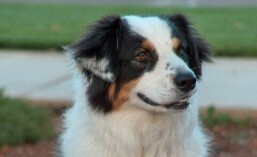 This entry was tagged aussie, australian shepherd, blog, dog, high tech, humor, techie, tekee. Bookmark the permalink.